My children hardly wanted anything for Christmas. They only asked Santa for a couple of things each, and my wife and I had to work to come with a few extra gifts for them. Then after opening presents, my daughter happily commented that she had gotten more than she asked for. Gratitude. That’s something we could all use more of. We homeschool our children, and we don’t own a TV, so my kids aren’t aware of what they don’t have. My 11 year-old spends his days reading (right now Lord of the Rings) and immersing himself in whatever he is fixated on at the moment (currently D&D and bearded dragons, previously Star Wars novels, Star Wars origami, Star Wars light sabers, cartooning, fishing, board games, et al.) My 5 year-old constantly plays with the dog (her mostly companion), goes around the house making up songs and poems, or pesters us to read to her (she is surprisingly effective at this, she has even made up ‘The Begging Song,’ which is pretty funny). They also both play outdoors and draw a lot. We’ll talk about homeschooling as we go, but the lack of TV has been interesting. And freeing. First of all, we still have the TV screen, so we watch movies about once a week. Because my kids aren’t blasted with high-energy programming, they’ll watch near anything. They love old musicals, but they’ll also watch documentaries. One Christmas gift we got them was the DVD set of Jacob Bronowski’s BBC series The Ascent of Man as an introduction to broad historical ideas. I’m interested to see how that turns out. And they will listen to almost anything we read to them. I still read to both of my kids every night, right now we’re working through Karen Cushman’s Catherine Called Birdy, the rare children’s novel dealing with the medieval (although now that I think about it, I read my son Elizabeth Janet Gray’s Adam of the Road a few years ago). If we’re reading, they’re game. I think the most impressive instance was when my daughter, 4 at the time, sat for almost two hours straight listening to me read Robin Lee Graham’s The Boy Who Sailed Around the World Alone. I would have thought it dry for most children of her age (or most children of my age), but whenever I tried to stop she would complain. She hadn’t created ‘The Begging Song’ yet, but she still held the day. That’s their lives. So to my mind, the biggest reason they don’t want much is that they don’t know about much, at least not much about things. 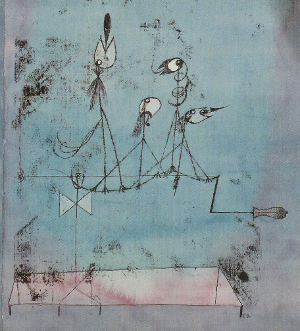 The picture above is Paul Klee’s Twittering Machine (Die Zwitscher-Maschine). I am surprised that there are so many interpretations of it, many which take whimsical and childly points of view. There are three inescapables here: the title; the birds, or birdlike things; and the crank, clearly meant for a human hand. Unless this is simply a sort of mechanical music box – and that doesn’t seem to fit with Klee’s other work – then there seems to me to be only one interpretation: the birds are being forced to sing. If they are not captive, the crank will not work. And if the crank forces them to twitter, then it’s a very dark image. Certainly their positions suggest misery. Given that interpretation, it could be a comment about man abusing nature, which would certainly fit into the Expressionist tradition. But I think that this is an allegory of political oppression, it is a torture device. We tweet what we are compelled to tweet. That is my metaphor for the television. Much of television is cost-free, or seemingly so, because advertisers pay for it. But if advertisers didn’t make a profit from influencing our buying behavior, the system wouldn’t work. So the television changes us by teaching us to sing the songs it give us. …we just bought their products. Except that it can’t make us good enough. Nobody is that good. Nobody is always glamorous, no one lives a life without setbacks and embarrassments and loss and frustration. Nobody. We don’t seem to notice. We all scramble around, wanting more things, shopping for more things, buying more things. Next time you go into a WalMart, consider that the Inventory Turnover for everything thing you see there, is right at 6 months; at that point, just about everything will be bought. Then consider a few months after that, or a few years at best, all of it will be in some landfill. That is what we expend much our lives pursuing, landfilling. It does not seem to make us happier; to the contrary, our slakeless thirst for things makes us resentful that we cannot buy more, have more, be more. That is the song many of us are compelled to tweet. So while I have been excited about the fact that my kids don’t want a lot of stuff, it was only in the past couple of days that I realized maybe – just maybe – my wife and I have given our children a greater gift than any I had planned: contentment with what they have. Maybe our kids are simply happy. The future is large, and there is no guarantee about how any child will turn out. But if my children remain curious, creative, confident, and content with less, and they are able to earn a living, then I can’t imagine what more I could want for them. My wife and I will be very grateful for that. If you enjoyed this article, please ‘Like’ my blogging page on facebook.